The West Highland Way winds its way through a huge variety of magnificent landscapes on its‎ 95 mile course between Milngavie (near Glasgow) and Fort William. The scenery is in places almost painfully beautiful: grand crags and purple hillsides above glens; and famous bonnie banks of Loch Lomond. 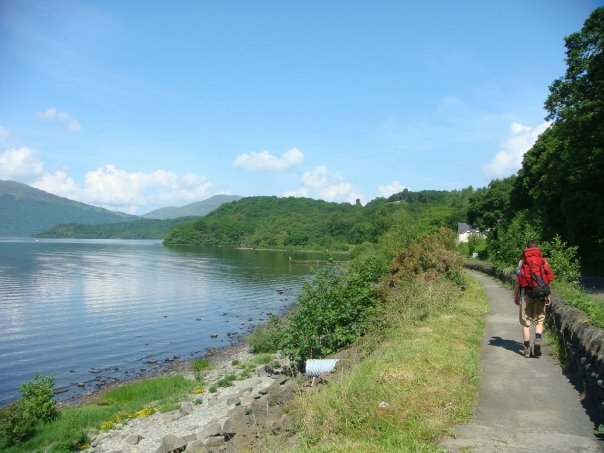 The West Highland Way (WHW), the first trail to be officially designated as a long distance route, winds its way through a huge variety of magnificent landscapes on its‎ 95 mile course between Milngavie (near Glasgow) and Fort William. The scenery is in places almost painfully beautiful: grand crags and purple hillsides above glens; and famous bonnie banks of Loch Lomond. Western Scotland has a huge variety of weather at any time of year, so always come ready for unpredictable weather. Much of the way follows old drovers' roads, the green ways which networked the Highlands, along which the highlanders drove their cattle to the markets of the Lowlands. These are a precious national asset. Other stretches follow old military roads, which were build by the Hanoverians ‎as a means of suppressing the Highlands after the '45 rebellion. 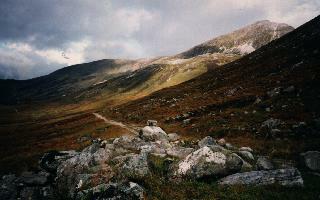 You can walk the WHW in 6 days, although this would be a bit of a slog and not leave much time for exploration. Better 7 or 8 days.‎ You can walk it south to north (most people do and a bit easier), although north to south for some sun and wind) on face is also popular. Day walking sections of the WHW is very practicable, as it often meets roads. Your choice of day walks would depend on your aspirations, energy and determination. Most would agree that days 5 and 6 are the finest walking when all factors are taken into account. Walking south to ‎north, if you are aiming to do the Way in 7 days, the stages are as follows. Day 1 - Milngavie to Drymen‎. A gentle 20km escape from the outskirts of Glasgow to near the foot of Loch Lomond. Not the WHW's most thrilling day, but a good leg-stretcher in gentle farmland. Day 2 - Drymen to Rowardennan: a more demanding 24km rolling route near the famously bonnie banks of Loch Lomond. Gorgeous scenery and rich wildlife. Day 3 - ‎Rowardennan to Crianlarich: a long and demanding 32km day which leads steadily into the wild grandeur of the Highlands, although this is a section which can be done over two days by those wanting a more relaxed approach. Half the day will be beside the beauties of upper Loch Lomond, thereafter climbing Glen Falloch (unfortunately in the company of the A82), for a substantial part of the way on an old military road. Day 4 - ‎Crianlarich to Bridge of Orchy: this 21km stretch winds up beautiful Strath Fillan to Tyndrum, often in lovely open forest, taking in the scanty remains of St Fillan's Priory on the way. Thence a climb up a narrow,steeply dramatic glen takes you over the east-west watershed and down into the wide, flat-bottomed, gorgeous Auch Gleann with fine, conical (iconical?) Beinn Dorain ahead. A lovely tramp along on an atmospheric old military road gets to, eventually, to Bridge of Ochy. You are, unfortunately, in the aural if not always visual company of the A82 road the whole way - and at least one railway line, a real dampener for wilderness lovers. First you cross a shoulder of Ben Invereigh, with exceptional views even by the marvellous locval standards, and desend to round the end of beautiful little Loch Tulla, with Loch na h-achlaise and the Black Mount looming grandly beyond. Rannoch Moor is outstanding by any standards, a ‎high empty plateau of hill and moorland with grand highland mountains in the background, riven by burns and littered by delightful little lochs. The valley of the River Ba, at its heart, is meltingly beautiful on a good day, and sinisterly so on a bad one. Along with Day 6, the best the WHW has to offer. Day 6 - Kingshouse to Kinlockleven: another magnificent days' walking, much of it on an old military road, west toward the head of great, infamous Glen Coe, then turning north to cross the rough hills that separate you from the head of beautiful, narrow Loch Leven. A relatively easy 14km. Day 7 - Kinlochleven to Fort William: a long (22+km) but fine day, much of it approaching then following the lovely, lonely Lairig Mor glen on another stretch of old military road. 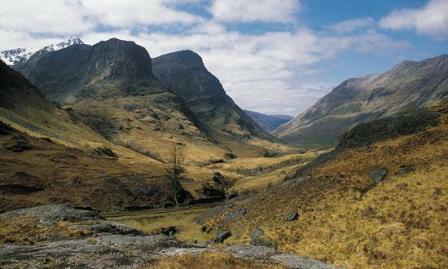 A final crossing of hills takes you to Glen Nevis and the final walk-in to Fort William. Bravo!! "Thousands of walkers, endless information on the internet... it must be the exceptional beauty of the Way. We started our trail at Crianlarich, leaving behind Milngavie (Glasgow) and Loch Lomond. There is a train connection between Glasgow and Fort William, the end of the West Highland-way. So, in fact you can start everywhere, the train follows the route. A well way-marked trail." Seven small events that made his walk along Scotland’s West Highland Way so memorable. Every great journey should begin with a jumbo sausage roll. Flaky pastry crumbs provide extra sustenance for negotiating nasty clumps of gorse bushes in Mugdock Country Park. But there is more to the West Highland Way long distance footpath than sausage rolls and gorse bushes. People focus on the big wonders; Loch Lomond, Glen Coe, Ben Nevis. For me though, it offered seven days of amazing, small wonders. Conquering Conic Hill’s 1200-foot summit is not taxing, or even enduring, unless it marks the end of a long, tiring, 20-mile first day. The muscle motivating view uplifted my spirits to a far higher altitude. In the calm, evening light, Loch Lomond’s islands were molehills in a golf green, or stepping-stones to the Arrochar Alps. Glancing left, I watched the windows of Glasgow’s tower blocks dazzle in the fading evening sun. Leering to the right enabled me to see into the future … well … the next three days. The Highland Boundary Fault beckoned, drawing me magnetically, ever closer to Fort William. That was the small wonder of Conic Hill. Conquering it inspired me to reach my journey’s end. Rob Roy’s Cave was an unexpected wonder. There is nothing cavernous about this crevice. In fact, it is so small it’s easily missed if it weren’t for the word ‘CAVE’ daubed on an adjacent rock. I give it small wonder status because of its historical qualities. My fingers read the rock face. History in braille. Every nook, cranny, serrated edge and weather-beaten face reputedly witnessed the legend that was Raibeart Ruadh, to use his Gaelic name. Here, the valley narrows. The slopes of Beinn a Choin and Little Hills squeeze Lomond’s waters to lap at the Way as it traverses this rocky, tree-root strewn section. There are no sanitised country parks now. The two-day-old bristles on my face tightened. A breeze flew across the water and the crags around Rob Roy’s Cave nicked my finger. I shuddered. It was as though hundreds of eyes through history were watching my every step. 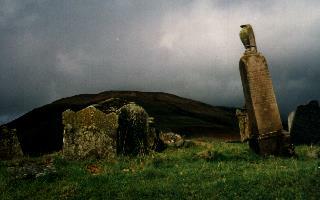 Gravestones. I defy anyone standing on the West Highland Way between Kirkton Farm and Auchtertyre not to marvel at the optimistic patch of sloping ground, surrounded by a dry stone wall. Optimistic, for its sheer size and relative emptiness. This slice of heaven won’t fill up; the locals abandoned it eighty years ago. For the first time since Milngavie, I felt alive, ironically. This final resting place stole my heart. It would have to wait for the rest of my body, though! Under the auspices of a headless Beinn Odhar, with a thick, low cloud scarf around its neck, I encountered the West Highland Way height restriction. A cattle creep under the West Highland Railway Line. Bending down brought my nose closer to the floor, clarifying that cattle clear their bowels whilst creeping. My head cleared the roof, but my rucksack wedged tightly against the concrete blocks supporting the railway line above. A low rumbling noise penetrated my thoughts. The puddles at my feet danced. The rumbling crescendoed. My eardrums throbbed. Fear engulfed me. I lunged forwards, then backwards, forwards, backwards, but my rucksack was rammed fast against the ceiling. St Fillan’s graveyard was a beautiful experience, but I wasn’t ready for it yet. My survival instinct kicked in. Unbuckling the waist strap, I dragged my arms from the shoulder straps, lurched forwards, through the metal gate and out into the open, fresh air. Turning around, I watched the bogeys of the two-carriage Sprinter train clatter by, hurtling towards Tyndrum. Underneath, my rucksack swung nonchalantly, before suddenly, plummeting into the cattle creep mess. If a ‘wonder’ is something unexpected, then this cattle creep was certainly an unexpected experience. Weather forecasters are put through their paces on Rannoch Moor. This wilderness experiences every form of weather possible within a matter of hours. Submerged trees rose menacingly from lochs, adapting to survive in this harsh environment. Even Mother Nature fights to subsist here. Crossing this 13-mile section of open, windswept, bog deserved respect, although this is not my wonder, for it is not small. Near the end of the day’s passage lies the most photographed mountain in Scotland. Buachaille Etive Mhor. Majestic. Imposing. Foreboding. But, my wonder was snuggled at its foot, occasionally slipping into the odd photo too. Blackrock Cottage’s white-washed, stone walls with reddish-brown doors squat assuredly on the moor’s edge, hugging the ground: it’s roof barely a few feet from the soil. Two diminutive chimneys stab the sky. After crossing that inhospitable moor, its sight raises morale. A sign of civilisation. My spirits experienced sheer wonderment that the unmitigated beauty of Rannoch Moor gave someone journeying across this inhospitable land centuries ago, enough courage and determination to build a shelter here. Rannoch is a wonder in its own right, but striding closer to the Kingshouse Hotel, I marvelled at the wonder of Blackrock Cottage’s builders. Way walkers have two common goals. To complete the route and to get a good night’s sleep. Having climbed the Devil’s Staircase and clambered high across the mountains to Kinlochleven, it was with weary legs that I dropped into the town’s bunkhouse. I was sharing a small room with a father and son team. His ex-army mannerisms relished this 95-mile challenge, whereas his 16-year-old son’s lack of effort suggested he was enduring the family tradition his two older brothers had already undertaken. There were also thirty under-11s sharing the bunkhouse, busy re-enacting the Glencoe Massacre. Despite starting at 3pm, by 12.30am they still hadn’t finished. Gut-wrenching screams, rallying-warrior cries and shuddering walls penetrated our twin bunk-bedded room. At 12.38am, Military Dad opened the door and bellowed so loudly, both sides of the Glencoe Massacre hit the decks, never to move again until after I’d left later that morning. It was the best night’s sleep all week. I never saw Military Dad, or his son, again, but his ability to silence thirty children with one bellow is a wonder I shall not forget. Anticipation propelled me through my final day. Up, past the dramatic Grey Mare’s Tail waterfall, into the heart of the mountains, with Stob Coire na h-Eirghe rising on my right and Beinn na Caillich guarding my left. Meandering through the Mamores, I marvelled at the surroundings as I plummeted down into Glen Nevis. Suddenly, my path was tarmacked and the road bustled as my destination drew closer. I don’t know what I was expecting at the end, but it wasn’t a roundabout. At first, it was an anti-climax. But whilst the Nevis Road roundabout wasn’t a wonder to the A82 motorists, it signified the end of my journey. My achievement. My success. A wonderful feeling. Not many roundabouts do that. The West Highland Way not only offers stunningly wonderful scenery, but the chance to experience a mixture of emotions and small wonders. My journey back by the Citylink 916 service did not take seven days, but 2 hours 58 minutes. Not as wondrous, and an entirely different experience. It would take much more than a jumbo sausage roll to make that journey more exciting!